This is a review of the Notefile app for iPhone and iPad, released by JuneCloud, and guess where I’m writing this review? In Notefile, on the iPad, using the wireless bluetooth keyboard. JuneCloud has previously released some killer apps, most notably their Delivery Status app which has become the standard package tracking app in the App Store. Their latest release is Notefile which takes advantage of the awesome cloud syncing functionality built by JuneCloud and uses it for a note taking application. Notefile works as a universal binary on both the iPhone, and iPad and syncs your notes across both devices over the cloud. If you’re a Mac user, you can also download a free Dashboard widget that syncs your Notefile texts to and from your desktop. Finally, if you’re not at your computer, or on a Windows box, you can go to junecloud.com/sync and manage your notes from any web browser. Once you load Notefile, it will automatically pick up your existing JuneCloud account and log you in, if you’re already using any of their other apps. If not just sign up for an account and login. Its painless and best of all, free. Notefile’s layout is super clean and deliberately simple. You have a plain piece of paper with rounded edges. If the super slick icon doesn’t give it away, the color of the paper in Notefile is a slightly textured ivory that is reminiscent of a Moleskine notebook. There are no lines on the paper which is a fresh look. As you start typing, Notefile automatically makes the first few words the name of the file and shows that on the left side of the iPad screen. Tap on the right side to start typing your note. There are not many options in Notefile. Much like the WriteRoom and Byword Mac apps, and the Essay app on the iPad, you have few settings to fidget around with. You can basically just enter your Junecloud account info, and read a small help section. You can’t change the font size, font type nor the paper style. You can’t type in anything other than plain text. Syncs are done automatically behind the scenes and you can’t force a sync manually. A message on the bottom of the app shows you the date and time when the note was last synced. For what I need Notefile is actually a perfectly created writing app. It’s great for taking notes and having them accessible on a series of devices so I can continue my writing process from anywhere I am at the time. Full Screen: A full screen view would really help. I don’t really need to see a list of notes on the left pane at all times and could use the full iPad real-estate especially when in portrait view. 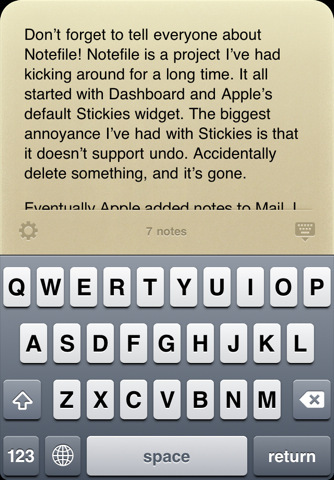 Interestingly, the iPhone format works better with the list of notes on the bottom of the screen. As an added bonus it would be even better if I could just swipe and flip the pages of the digital pad, to move across various notes. Word count: It would be nice to have an updating stats line that shows total words and character counts as you type. Typing sounds: Only a few minified typing apps have this feature and it can be somewhat fun and rewarding to hear a typewriter sound as you type. Yes I know I can just use the iOS sound, but I want custom sounds, with a different sound when you hit the enter key. One of the apps I’ve found that does this well is actually a Windows app called WriteMonkey. Drawing: Given the app has a moleskine look, it would be really nice to have a touch to draw feature added to Notefile at some point. That would probably complicate the syncing feature so I can see why it may not be a trivial add-on. 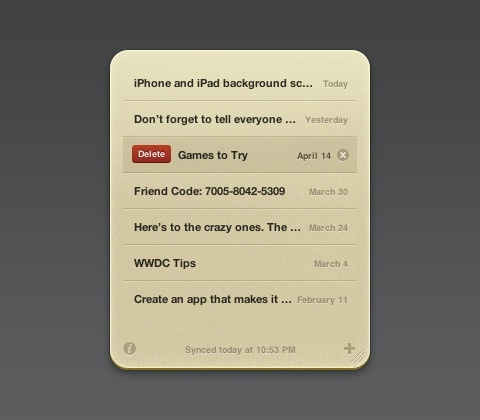 Sorting: Agin, given the awesome cloud syncing, some might want to use this app as a list making tool. For that reason alone, it might be good to be able to drag the notes around and re-order them. Dropbox: Don’t get me wrong. I love the JuneCloud sync tech, but it would be nice if I could see the notes show up as text files in my dropbox folder as well. Finally, It would be nice to be able to edit the file name. Right now the app just takes the first few words from the first line of your text and makes it the file name. Overall, if you’re looking for a beautiful, and seamlessly synced note taking experience that feeds into your iPhone, iPad, Mac and the Web, Notefile should definitely be on your radar. With a few simple updates, I would think that Notefile could easily become a contender for one of the most useful text editing apps in the store. Notefile is a little pricey, but you do get free syncing, and an awesome company that I’m sure will provide many updates and enhancements. 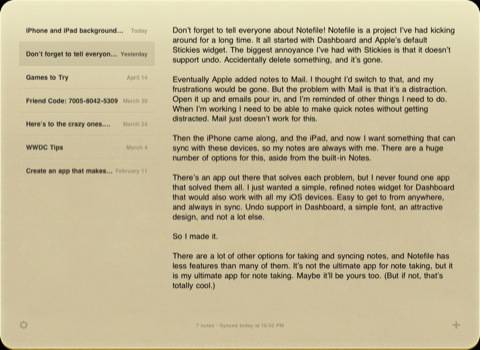 AppSafari review of Notefile was written by Joe Seifi on June 3rd, 2011 and categorized under App Store, Featured, iPad apps, Notes, Universal. Page viewed 4233 times, 1 so far today. Need help on using these apps? Please read the Help Page.